Artists have always cannibalized other media, all the way back to the Babylonian scribe with the bright idea of stringing a bunch of Sumerian poems together into a single epic. So it’s no surprise that movies and videogames have been borrowing from each other for years. What’s surprising is what a terrible job they’ve always done of it. Calling a videogame “cinematic” is often a polite way to say “boring,” and “videogame movie” is even more of a slur. These connotations have been well-earned over decades of terrible films and games. But this summer may mark an important turning point: videogames and movies are finally starting to steal the right things from each other. When it comes to borrowing from other media, cinema has always been particularly rapacious. Anything can be turned into a movie, from amusement park rides to board games, as long as it has what screenwriter Terry Rossio dubs “mental real estate.” So as soon as it looked like there might be an audience in games, filmmakers drew their plans against them. The results were disastrous. The first film adaptation of a videogame, the Japan-only release Super Mario Bros.: Peach-Hime Kyushutsu Dai Sakusen!, was created under the misapprehension that people played Super Mario Bros. for its compelling story and characters. Despite the film’s rapid disappearance into obscurity—Wikipedia notes that “How much it grossed and what reviews it got remain unknown”—the first American videogame film had the same flawed premise, but for more money and with Dennis Hopper. In the years to come, filmmakers made the mistake of stealing plots and characters from games again and again and again. The videogame films that weren’t complete catastrophes—Mortal Kombat, Tomb Raider, some of the Resident Evil movies—achieved mediocrity by skipping right past videogames and stealing directly from the same movies the games had. Some films were inspired by videogame aesthetics—compare the climax of 2007’s Beowulf with 2005’s Shadow Of The Colossus, for example—but for the most part, these films only managed to create the thrilling sensation of watching someone else play a videogame. Game designers have been slightly more successful thieves than filmmakers, but only slightly—and they’ve been stealing for much longer. 1961’s Spacewar!, by many accounts the first true videogame, was partially inspired by Japanese science-fiction films. Since then there have been hundreds of direct videogame adaptations of films, from 1976’s Death Race through this summer’s The Amazing Spider-Man 2—and the one thing these games tend to have in common is that they’re terrible enough to bury in a shallow grave in the middle of the desert. (One of the rare exceptions is the 1997 Nintendo 64 game GoldenEye, and the things that made GoldenEye a great game have nothing to do with the James Bond film of the same name.) Games with cinematic pretensions that aren’t direct adaptations have historically taken the least suitable elements from films and used them badly. The Grand Theft Auto series, for example, began as fun, simple mayhem, but over each iteration slathered on poorly drawn characters, setpieces from much better movies, endless cutscenes, and dull misogyny until they became more boring than Pong. (And if no one ever makes another videogame re-creation of Aliens’ space marines or Saving Private Ryan’s Normandy landing, it will be too soon.) It’s not enough to import a plot or characters or memorable setpieces into a game and expect it to work. But game designers are finally starting to find ideas and techniques in film they can use to tell effective stories of their own. Some of the greatest films ever made go to great lengths to encourage the audience to identify with characters who are morally suspect: psychopaths, voyeurs, or just dangerously oblivious buffoons, then use that identification to pointedly explore broader questions. (This technique isn’t unique to film.) For all of cinema’s seductive qualities, filmmakers have to do some work to build the relationship between audience and character. Videogames get this essentially for free—whether the player is controlling Nathan Drake or Ms. Pac-Man, the wire between the joystick and the protagonist forces a strong identification. But it’s only very recently that videogames have started taking advantage of the narrative possibilities this provides. Quantic Dream’s 2005 game Fahrenheit was an early example, working a little like the tennis match/storm drain sequence in Strangers On A Train. Players alternately control a murderer and the police trying to catch him, and find themselves wanting everyone to succeed. 2010’s Red Dead Redemption does something a little more interesting with player identification, telling the player again and again that the protagonist, an ex-outlaw during the closing of the American frontier, is out of his time and won’t make it to modernity. But because the structure of the game has the player beat impossible odds again and again, it’s devastating—and thematically perfect—when the game forces the player to face enemies he can’t defeat. 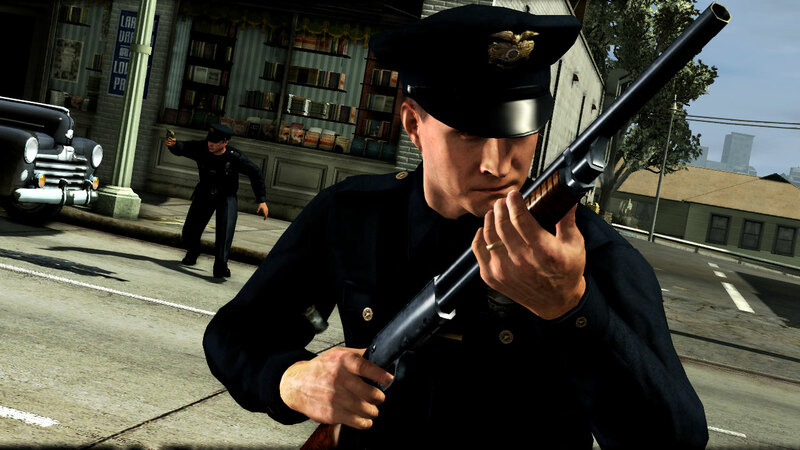 Until last summer, L.A. Noire was perhaps the most impressive example of this technique. The player controls a seemingly morally upright detective in a meticulously re-created 1947 Los Angeles. In the opening sequences, both player and protagonist solve mysteries, punish the guilty, and protect the innocent—standard videogame power-fantasy stuff. But the game begins to reveal a gulf between who the player wants to be and who the protagonist actually is, and by the middle of the second act, the protagonist is railroading political undesirables, ruining his marriage, making reckless political decisions, and generally forcing the player to think long and hard about that initial easy identification. None of these games were perfect, but they were steps forward—they use cinematic techniques and inspirations to begin to tell interesting stories. But last summer was a watershed moment for the industry, with the release of Naughty Dog’s The Last Of Us, the first videogame that not only steals interestingly from the movies, but in many ways improves on its source material. On its face, the game couldn’t be more derivative—it’s a zombie game, one of hundreds. But instead of drawing (too much) from Romero, its spiritual ancestors are Children Of Men and The Road. The game’s prologue is devastating to the point of cruelty in the way it uses the player’s identification with the protagonist to destroy any idea that it will be a power fantasy. And although violence is still a core gameplay mechanic, in The Last Of Us, it’s chaotic, difficult to control, extraordinarily unpleasant, and, as Kirk Hamilton has pointed out, emotionally deforming. In its equally well-executed conclusion, the game uses formal narrative symmetries—common in film, rare in videogames—to explore repetition compulsion and the way loss and violence warp people over time. The final shot is a direct quote of the final shot of The Road, but its emotional import is inverted—in John Hillcoat’s film of Cormac McCarthy’s novel, we’re seeing someone decide to trust someone else; in The Last Of Us, we’re seeing someone come to terms with the fact that she can’t trust anyone. Quoting from a film to complicate and comment on the meaning of a shot, instead of simply copying, is new for games, and a huge step forward. And this summer the pipeline has started flowing both ways. Two of this year’s best summer blockbusters wouldn’t exist without videogames—not because they’re adaptations, but because they were made by people who have been paying attention to what videogames might bring to film. The first, Edge of Tomorrow, is set in a world controlled by videogame rules. Fittingly enough for the first great videogame movie, the filmmakers take the two most clichéd and overused premises that videogames stole from the movies—Alien’s space marines and Saving Private Ryan’s Normandy landing—steal them back, combine them, and make them new. The trick is that they don’t just steal the premise, but also the logic of videogames. Tom Cruise’s character is forced to relive the same day over and over again—the day he takes part in a huge battle against invading aliens, starting over whenever the aliens kill him. It’s a summer blockbuster about an alien invasion, not an Ecclesiastes-style meditation on the futility of human effort, but it takes a central, unexamined premise from videogames—you’ve died, so now you start over until you do it right—and finds interesting filmic possibilities in it. But Edge Of Tomorrow was a novel before it was a film—the original ideas were taken from games via the film’s source material, not directly. A purer example is Snowpiercer, Bong Joon-ho’s “thinking person’s blockbuster.” It, too, is an adaptation, in this case of a French graphic novel by Jacques Lob, Benjamin Legrand, and Jean-Marc Rochette. But, as Danielle Riendeau and others have noted, although the film shares a title and general concept (a speeding train carrying the last surviving humans) with its source material, almost all of the rest of it is taken straight from Irrational Games’ 2008 title BioShock. (The most strikingly new element is Tilda Swinton’s performance as Margaret-Thatcher-from-Mars, but then Swinton’s performance is the most original part of any movie she appears in.) The game is set in an underwater city created as a sort of experiment in Objectivism by an egotistical madman, and takes place roughly a year after a revolt of the underclass destroys virtually everything. Snowpiercer uses all of these elements, none of which are present in the original graphic novel. Ryan Industries becomes Wilford Industries, but many other elements are presented virtually unchanged. The creepy 1950s-style classroom, the hagiographic films about the train’s designer, the masked revelers attacking with improvised weapons: These are all direct lifts from Bioshock that don’t appear at all in the film’s source material. Even the art-deco look of the film—the train’s ornate bars and spas, the 1930s dresses—comes from the game; the train in the original graphic novel is sparse and minimalist in a sort of Frank Miller-presents-Amtrak way. 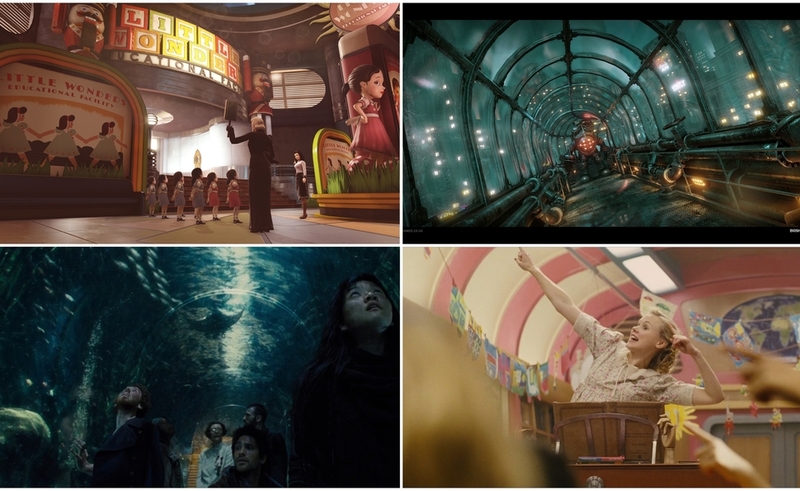 The resemblance becomes straight-up quotation when Bong takes the aquarium car, which is stacked with sensible shelves of fish tanks in the graphic novel, and reshapes it into one of BioShock’s beautifully impractical underwater tunnels. And Bong improves on the game by avoiding one of BioShock’s great failings: a long, monotonous second half following the player’s confrontation with Andrew Ryan. Snowpiercer ends where BioShock should have, when the protagonist meets the mad genius behind the curtain. To be clear, we’re not talking about masterpieces in either case; neither the game nor the film explores power structures with the alacrity of, say, Chinatown. But it’s a landmark that one of the most talked-about films of the summer steals its visual look and many of its ideas from a videogame. For one thing, it means games have evolved to the point of having ideas and aesthetics worth stealing, which is an accomplishment in its own right. An accomplishment, but not an endpoint. As ideas from one medium are creatively re-imagined in another, the cross-pollination can allow artists to see unexplored possibilities. And now, after decades of failure, both videogames and films are finally taking ideas from each other, complicating them and improving them in ways that suit their own strengths as narrative media. Not all types of film or game are or should be part of this conversation: No one wants to watch a Tetris movie or play Andrei Rublev: The Game. (Though, oddly, Tarkovsky has gotten the videogame treatment before). But that’s a distinction of genre, not of high and low art. Pulp fictions can still be masterpieces—look at The Godfather or The Wild Bunch or All That Heaven Allows. This summer we’re seeing the first signs of an interplay between media that has extraordinary potential. Welcome to the next level.